The view is breathtaking. 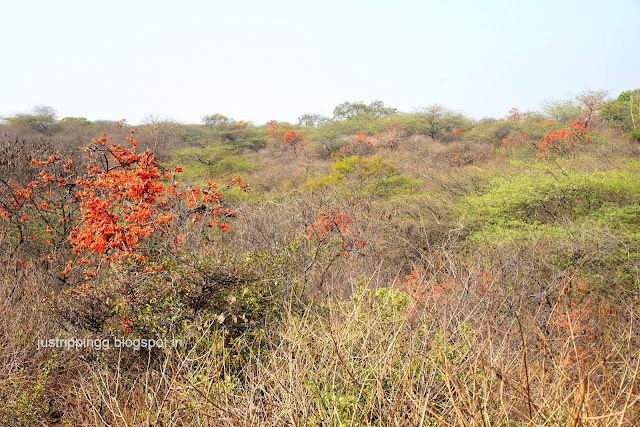 You have just clambered through thorny bushes on the top of this rocky outcrop that could perhaps be the highest natural point of Central Ridge in New Delhi’s Chanakya Puri. Assorted thorns, vegetation and seemingly velcro-clad seeds stick to your clothing and shoes. Last time you saw something similar was when you had climbed the Lal Kot (Delhi’s First City built by Tomars) ramparts in the South Central Ridge. However, this time the view is to die for. 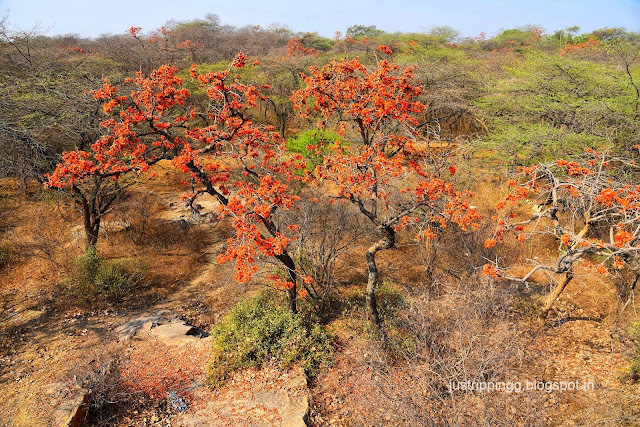 Interspersed among the mostly bare keekar trees are the glowing orange blooms of Palash trees. For the first time you realise why Palash is called the Flame of the Forest. Before this you had seen your Delhi’s first and lone Palash tree in Nehru Park. As you run your gaze over the forest, it does feel like sporadic flames are licking over the now brown landscape. Delhi has again surprised you. On Holi you could actually mistake the Palash blooms as Holika Dahan bonfires! 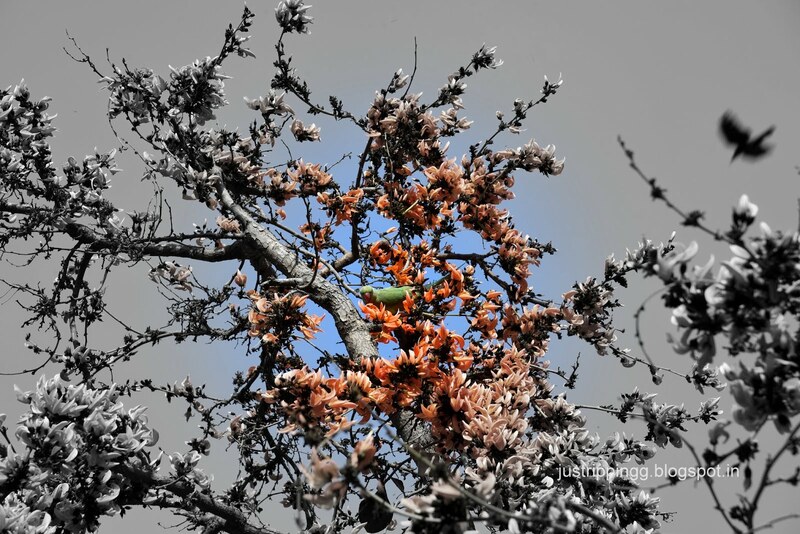 There is something surrealistic about the Palash blooms. The branches seem to have lit up with these bright orange flowers. Stand under a tree and gaze upwards at the spell binding sight. 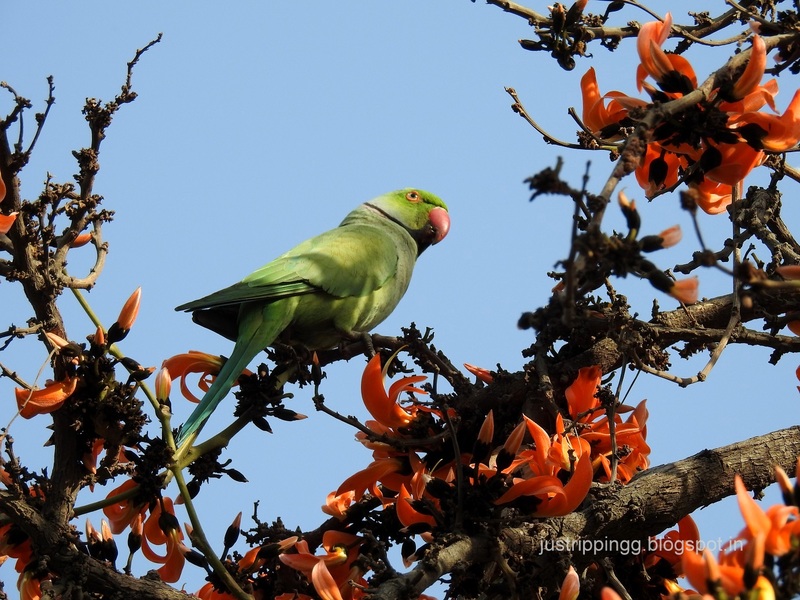 Shaped like the beaks of parrots and therefore also called Kinshuk (resembling parrot’s beak), it is not surprising that the blooms attract parrots the most, who are probably fascinated by the resemblance. 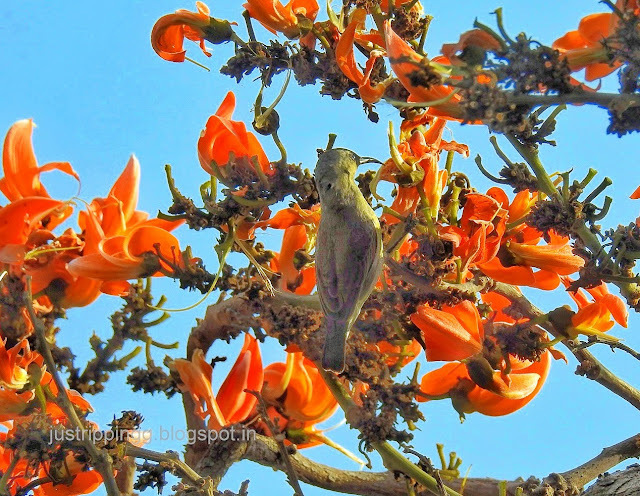 Purple Sunbirds flit among the flowers feasting on the nectar of the Raktapushp (red flowers). 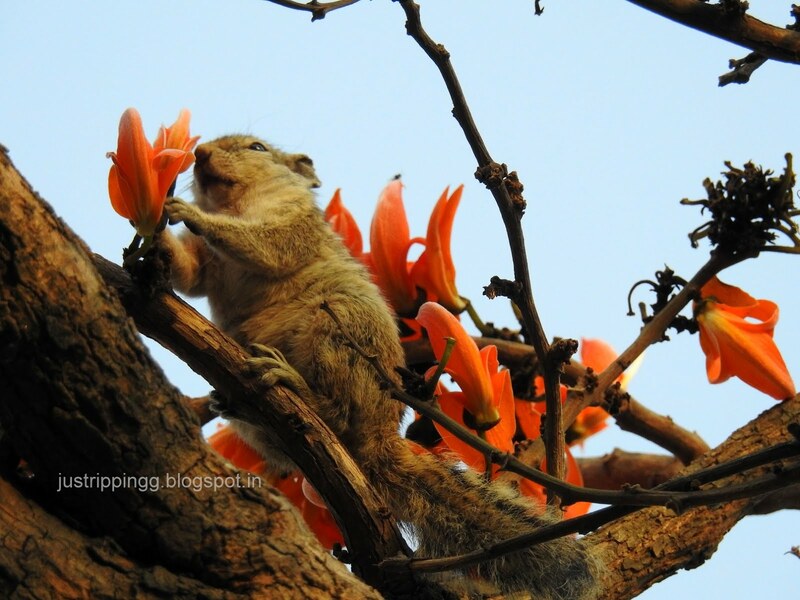 Squirrels can't believe their luck as they run dazed among the flowers playing peek-a-boo. Flowers drop around you. 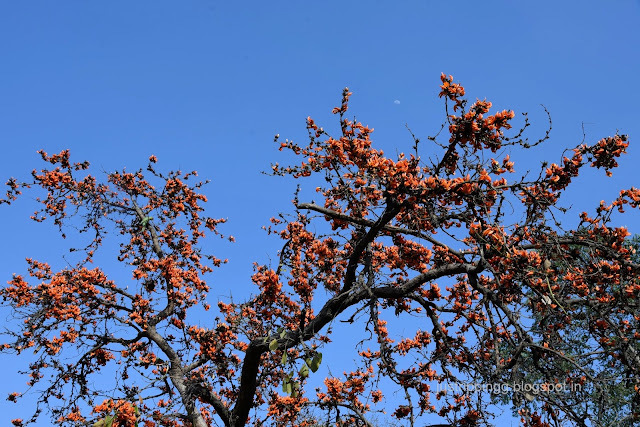 You never imagined that Delhi will treat you with Palash Hanami. This is heaven. 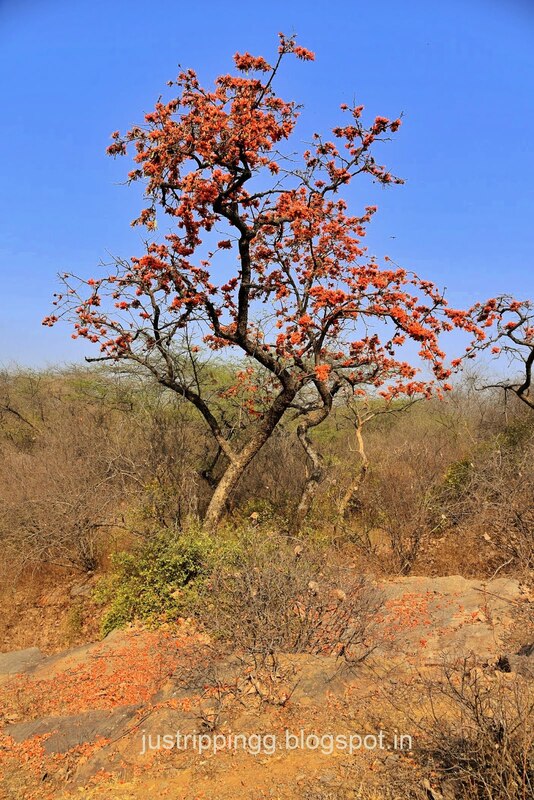 Palash or Dhak or Tesu (Butea monosperma) is a medium sized deciduous tree that belongs to family Fabaceae. Because of its country-wide presence, it has been lovingly given different names in different languages. The genus Butea refers to beautiful appearance of the flowers. 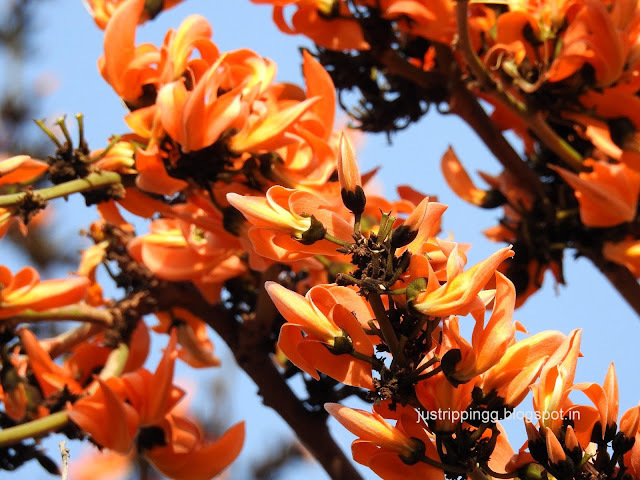 The specific name monosperma means “one seeded or fruit with one seed”. There has been widespread use of Palash in the traditional medicine. Palash is described in Veds, Upanishads, Caraka Samhita (ancient Sanskrit text on Ayurved or Indian traditional medicine) and Susruta Samhita (ancient Sanskrit text on medicine and surgery). In the past, the flowers would be dried and then ground into a coloured powder to be used during the Holi celebrations. But all is not well with Palash here in Delhi. Vilayati Keekar (Prosopis juliflora) introduced by the British on the ridge has become a pest that has caused the extinction of most native trees. It is heartening to see the few Palash trees holding out. You can’t help drawing an analogy here. 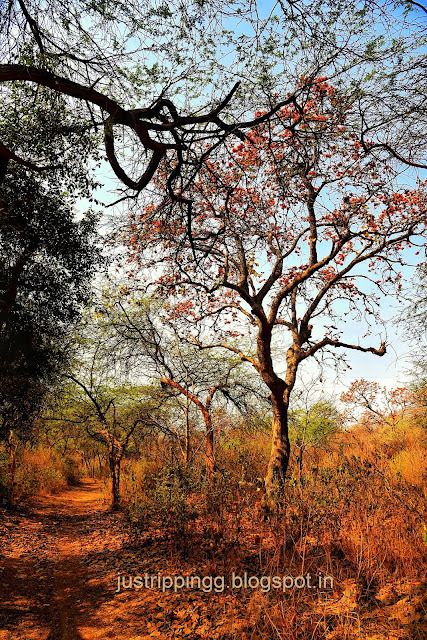 The Palash trees of the Ridge are like the monuments of Delhi. And the keekars are the ever increasing people and development of Delhi. As the exploding population and development pressures edge out the monuments from the landscape, the keekars infesting the ridge are similarly slowly elbowing out the original inhabitants like Palash, Dhau and Peelu. Right now you want to savour the sights. 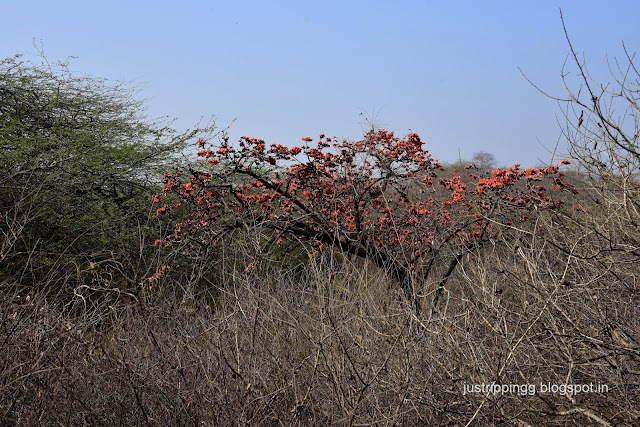 While the vegetation here in Delhi’s driest scrubland is wilting, the bright flowers wrapped around on the crooked branches of an unattractive tree is truly nature’s miracle. It is just not the parrots, sunbirds, squirrels and assorted bees that seem to be enamoured of the flowers; poets and writers too have serenaded the flowers with glowing words. Paying homage to the Buddha. 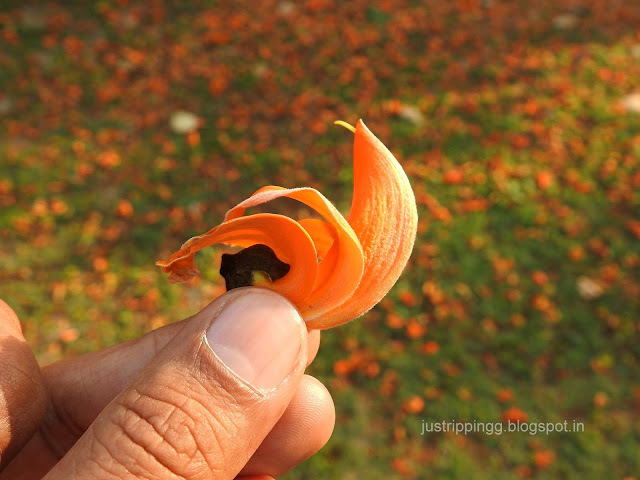 Now that you notice, the palash flower does look like a kneeling Buddhist Bhikshu – what an observation! Wont it be wonderful to have Palash lined roads in Delhi?! Tamala tree's fresh leaves absorb strong scent of deer musk. Flame tree petals, shining nails of love, tear at young hearts. "A little touch? Feel, a few words? Hear with what? Write my spring- song in my mind. Some ecstasy of Palash." Burns the dark contours of gloom..
spreading it's arms to meet the sky. It's reddish-orange blooms engulf your moments. enchants you into the lore of Nature. the Earth now soothes your inner conflict. The calling cuckoo beckons you to stay rooted. suckles the honey of the Flame of the Forest. squeks delightedly at the tree. Surrounded yet secluded, Palash stood aloof in this world of spree. Engulfed in the bedeck of it all I stood there enthralled. An ominous storm on the way. मेरी बाहों में आ कर सो जाना तुम. फूल पलाश के चुन लाना तुम. अपनी मुस्कराहट से मुझे बहलाना तुम. मीठी सी बातों को होठों पे रख लाना तुम. फूल पलाश के यूँ ही हर बार चुन लाना तुम. You could take in the views all day. The bunch of kids who have come to see Malcha Mahal, and who, you have dared to go deeper into the forest with you, are feeling restless. Selfies over, we slowly make our way out. But it is not easy. The track splits every now and then and you have to take a call which way to turn. 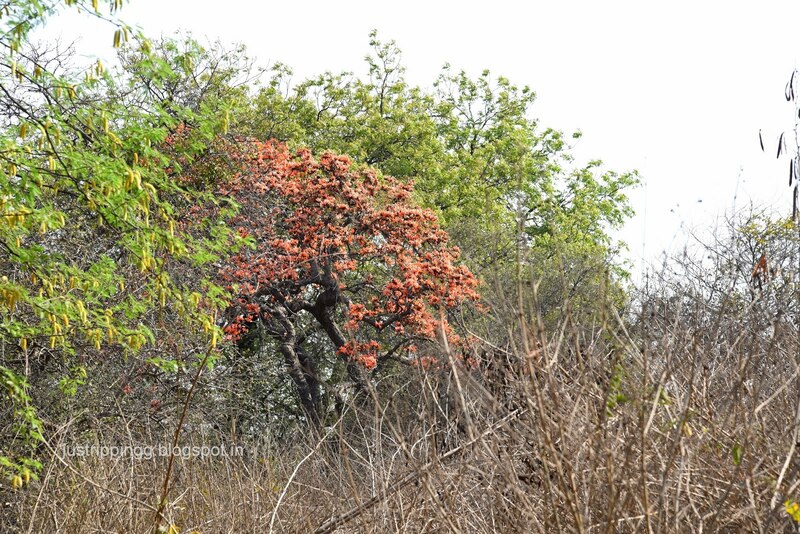 The bonus is that you see more of Palash trees and some of rare native trees of Delhi. Its not only in India that Palash finds so much love. 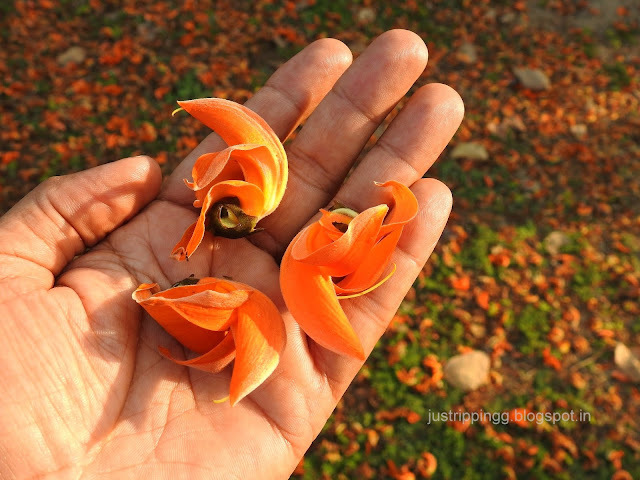 The 12th Century poet Jayadev likened the Palash flowers to the red nails of Kamadev with which he wounds the hearts of lovers. 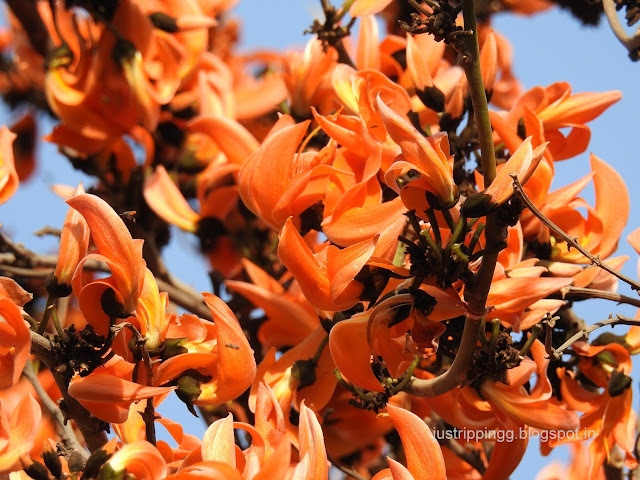 In neighbouring Thailand, the heart-broken lover on seeing the Tong Guao (Palash) blooms, remembers the broken promises of an unrequited love. 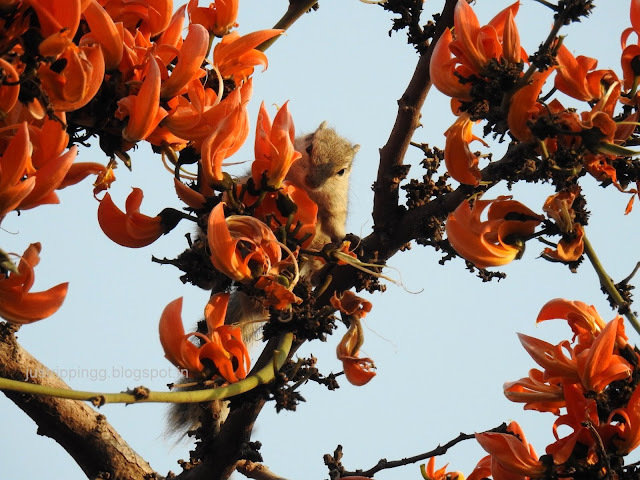 She asks the flowers to take her message and tell him that she is still waiting by the Palash blooms. Have you heard anything so heartachingly beautiful? 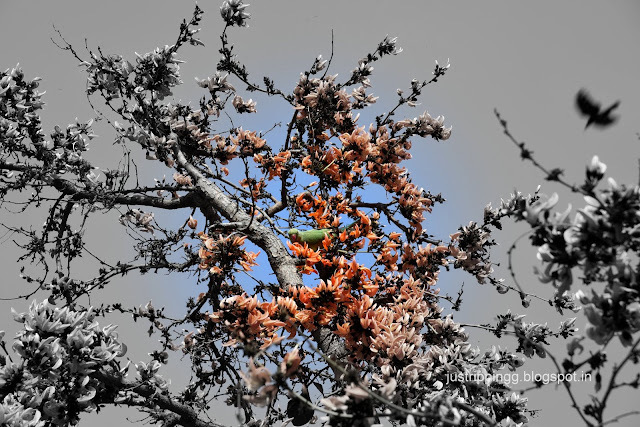 You were introduced to the magnificent sight of Palash blooms through these photos shared on social media. The photos set in rural Purulia in West Bengal showed moments in the lives of tribal communities. And in every backdrop there were these trees loaded with gorgeous red flowers. The blooming trees had turned the landscape into joyous colour drenched scenes. The lit-up branches seemed to have put smiles on faces and spring in the feet of all dwellers. The pictures seemed exotic and of lands faraway. You were not sure if you would ever be able to visit those places. 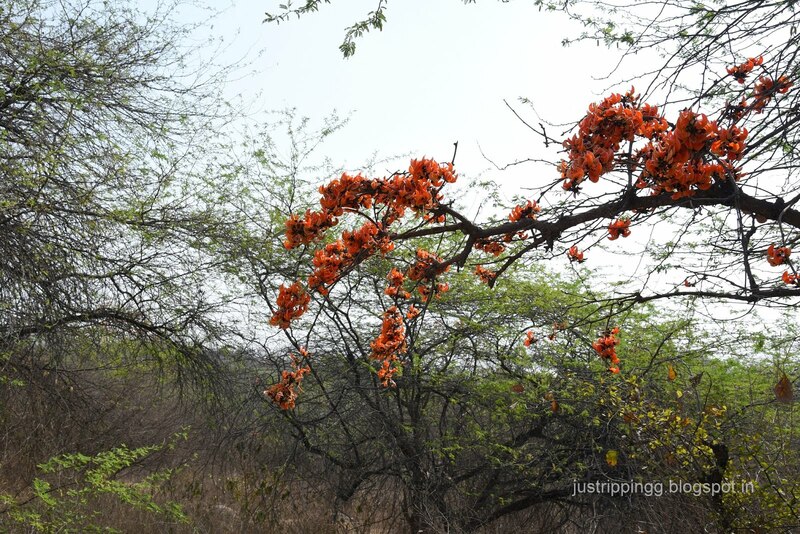 You had no idea that Delhi too offers these incredible sights of Palash flowers ablaze in a forest. 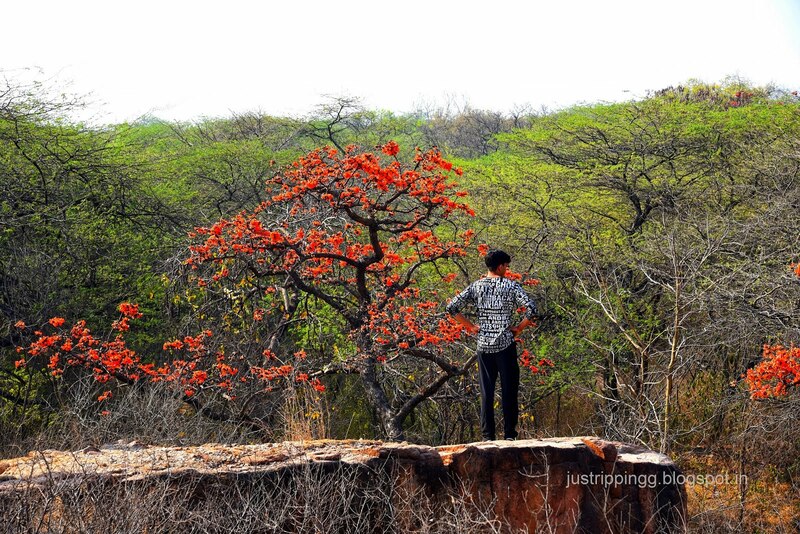 Until Purulia happens, Delhi has again smiled on you. A group outing is advised. The place does not seem safe though you did not encounter any one. The tracks fork every now and then and you got to just keep going. You possibly saw a pack of jackals who could have been wild dogs. If going alone, it is advised to carry a stick. Phone signals anyway are weak in New Delhi and you will not be able to use GPS. 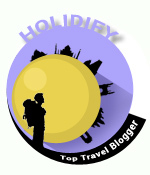 Despite all this, the experience is thrilling and everyone should experience the real Delhi. 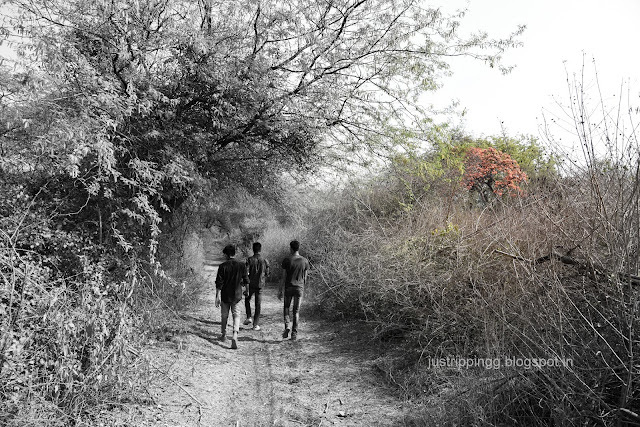 This is how Delhi looked before Lutyens created New Delhi in this scrubland. From one of the dargahs you can spot the Earth Station’s huge antennae dishes that look like a spaceship. Looking at them gives a spooky feeling – as if you are on the sets of a movie set in the future. You half expect aliens to walk out of the spaceship. You were trying to make it to the now uninhabited Malcha Mahal. The last occupant Prince Ali Raza (Cyrus), a descendent of the last Nawab of Awadh, Wajid Ali Shah died in Jan 2018. His mother and sister too had died as recluses in the spooky Mahal. This time you could not locate the palace. You will give it another try next time. On your way out, stop at the entrance to witness monkey feeding. Though the red-bottomed Rhesus Monkeys are usually wicked but here feasting on tandoori rotis, tomatoes and bananas has made them comparatively civilized. You can photograph papa monkeys, mama monkeys, baby monkeys and then the alpha monkey as they go around doing monkey business. On Sardar Patel Marg opposite Malcha Marg follow the sign indicating Earth Station. 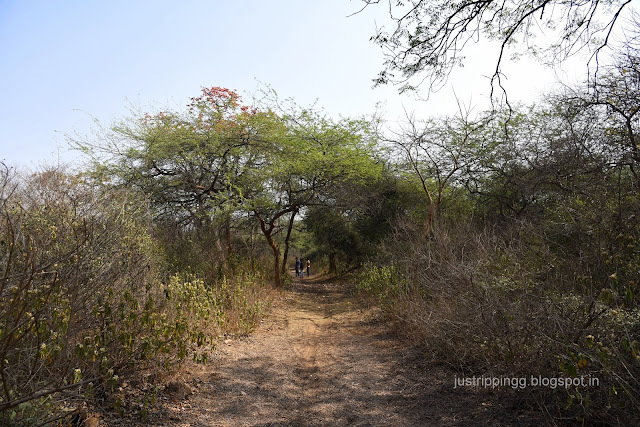 Drive on the track as it winds through canopies of Keekar trees until you see a clearing on the right. Park your car and take one of the dirt tracks. The adventure starts. One track goes northwards when you hit the Polo Ground. A little before the Polo Ground, turn right until you see the rocky outcrop on the right. Thanks for add my lines . So beautiful poetic post on plash . Thanks Mukesh ji for the beautiful lines!